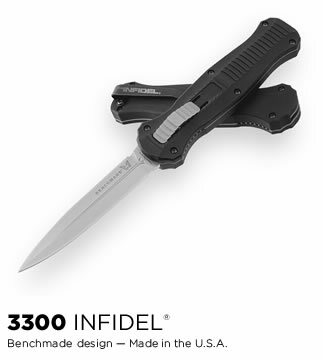 Pictured is the INFIDEL 3300 knife made by BENCHMADE KNIVES. This is a 100% USA made and carries the Benchmade lifetime warranty. Please find the specification below directly from the Benchmade Web site. Introducing an OTF like none-other.. The new Infidel® is rapidly making believers out of many a skeptic. Built for strength and reliability the patent pending double-action mechanics get it done over the long haul. Grab on and you will find the handle grip rock-solid with its patented machined in Presidio® style bi-directional tread pattern, and overall generous sizing for gloved hands. Intuitively pressure the release-slide forward and its spear-point edged steel fires and locks up with a unique three-point retention system with amazingly negligible blade play. Reverse the process and the blade retracts in a rapid blur of motion. NOTE: RESTRICTION MAY APPLY CONCERNING THE PURCHASE AND CARRY OF THIS ITEM. Military and LE are authorized to purchase and use as directed.